A Heartless resembling a monkey. It roams as it pleases, rarely paying attention to its surroundings. If Sora is spotted, it will call forth numerous allies, all armed with slingshots. The Sniperwild is an Emblem Heartless that is found in Kingdom Hearts Final Mix. The Sniperwild only appears as a special encounter in the Second District. A Sniperwild is a feminine, monkey-like Heartless with predominantly magenta fur. Its fur is covered by white stripes, the fur on its torso is brown, and the fur on its hands and feet is black. It wears brown and tan bracelets and armlets, a gold choker, two gold hoop earrings, and a violet bow. Its face is pitch-black and its eyes are glowing yellow. The Sniperwild carries a small slingshot as a weapon and its Heartless emblem is emblazoned on its chest. The former part of the Sniperwild's name highlights its weapon, a slingshot capable of hitting enemies from a distance. Other Heartless of its family share the latter part of the name, signifying that they are of the same species. 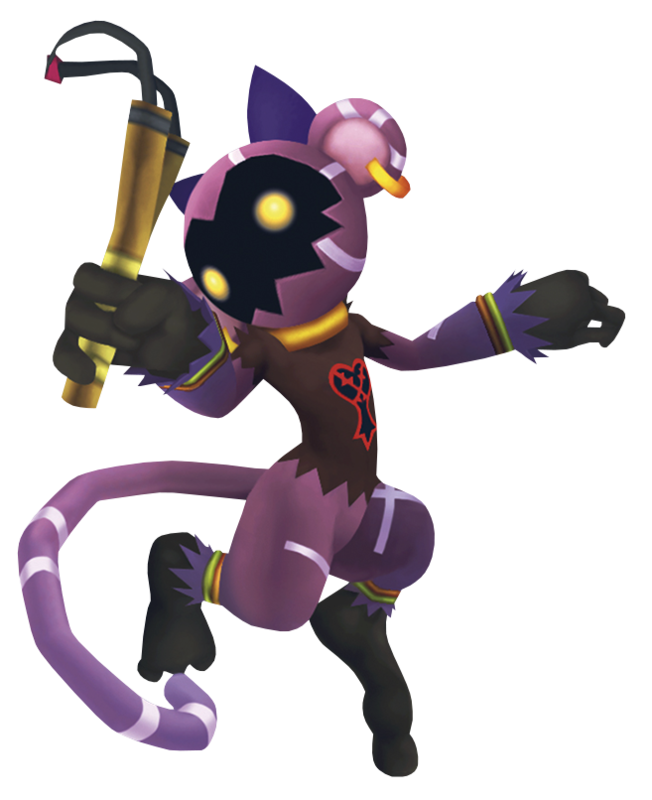 It also refers to the Heartless's wild, monkey-like appearance. Sniperwilds appear in waves, starting with one Sniperwild, then two, then three, and then starting over again at one. This continues until five cycles have been completed, or reinforcements are called in. Sniperwilds will hop around the room, searching for Sora with their glowing eyes. If he is spotted, the Sniperwild will start raising the alarm, and if allowed to finish, an endless stream of Sniperwilds will begin appearing and hitting the party with unblockable shots. Although the Sniperwilds can still be slain at this point, they will no longer drop items or experience and are very likely to knock out the entire party, so Sora should just leave the area and start over. In order to avoid this, Sora can either attempt to ambush a Sniperwild from behind and slay it before it can put out an alarm, or use a Stop spell to the same effect. As more Sniperwilds are defeated, the experience gained for each one will increase from 10, to 20, to 30, and so on, and they will be more likely to drop a Power Stone. ↑ 1 Tech Point for first Sniperwild defeated, 2 Tech Points for second defeated, etc. ↑ 10 Tech Points for first Sniperwild defeated, 20 Tech Points for second defeated, etc. This page was last edited on 25 February 2019, at 05:05.